If you trust Wikipedia, fieldwork refers to “the collection of information outside a laboratory, library or workplace setting”. However, philological ‘fieldwork’ often takes place within a library – but instead of reading secondary literature, we examine primary materials. I’m currently a visiting scholar at Queen Mary University of London. During my stay here, I work on 16th-century manuscripts and printed books in the British Library. Although early materials are increasingly accessible in digital form, and many early texts are made available in editions, not all research questions can be asked of these substitutes. Codicological, palaeographical, and bibliographical research methods entail close examination of books and texts as material objects. Analysing the physical construction of a book or the scribal hands present in a manuscript, for example, may also provide crucial evidence for studying the contents of a book. To access special collections, one usually needs to register as a reader (instructions can be found on library websites). After registering, you can then order items to study them in reading rooms. You can bring your laptop, notes, and pencils, but nothing that might damage the books such as pens or sharp implements. White gloves, although sometimes seen on TV, may also cause damage to the books. They are thus generally not used in professional libraries. Clean, dry, and careful hands are the better option! The University of Turku library also holds early materials. 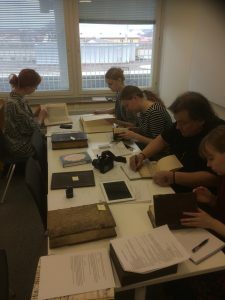 Last spring, students taking the Book History course organised by the Departments of English and European and World History had the chance to try their hand at being book detectives. My small group studied a selection of incunabula (books printed before 1501), practising the specialised skill of writing bibliographical descriptions of early books. Here they are at work! © 2019 EnglanTY — All Rights Reserved.